If I wanted to study government and politics close to Washington DC the University of Maryland-College Park would have been my choice for the journey to college. This is a large Big Ten school with over 26,000 undergraduates on a campus that is less than half the size of Rutgers’ main campus in New Brunswick. The University of Maryland-College Park joined the Big Ten in 2014. From 2014 through 2018 the number of applications rose from 27,300 to 33,600. The number of freshmen also rose from 4,100 to 4,700. Acceptance rates were between 44 and 48 percent, but the university has a few limited access majors, Government among them, that will be more selective. The average SATs have been just over 1300. The average GPA has been just over 4.0. I’ve found a lot to like about the University of Maryland-College Park, for instance. When it comes to general education requirements, courses that every student must take to earn a degree, Maryland separates itself through requirements in Scholarship and Practice and the I-Series. Scholarship In Practice courses, one outside their major. All Maryland students must take two Scholarship In Practice courses, one outside their major. These courses, according to the university’s Web site, require students to complete an original analysis, project, creative work, performance or other scholarly work. I-Series courses focus around “big ideas” or “big problems” where there is no right answer. These courses are designed by faculty who are among the most distinguished at the university and must be reviewed by peer academics before they can be taught to students. Maryland has two honors programs, unique even for a large university. The Honors College has seven unique interest groups. College Park Scholars has 12. Each has its own unique curriculum requirements as well as its own living and learning community. Nearly a fifth of the entering freshmen class will be in one of these two programs. There are other living-learning options as well that require an application. They help a student to build their resume, or even a business, at the very start of their education. Maryland undergraduates are at an advantage when a program involves an academic relationship or internship within the Baltimore-Washington Corridor. They can commute from College Park to the Smithsonian in about 40 minutes by Metro, after walking to the station from campus. Students who go to Maryland can pursue these opportunities during any semester, except possibly their very first. The university’s Federal Semester and Global Semester programs send students to work as interns in the White House, Non-Government Organizations, Federal agencies and interest groups. Maryland’s academic strengths in computer science, cyber security and engineering draw considerable interests from consulting firms and technology businesses in the region.Students who attend colleges outside of Washington D.C. would have that experience for one semester, rarely more. 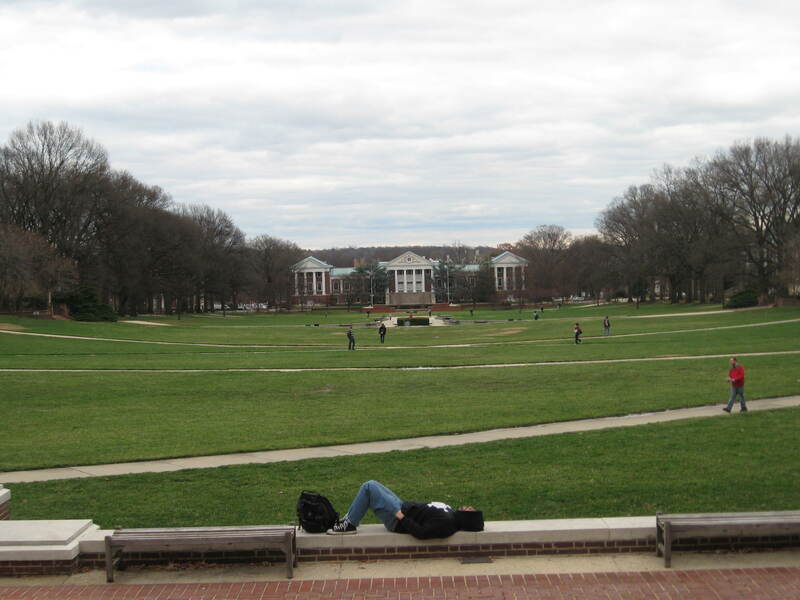 Maryland has the largest green space at any U.S. college: McKeldin Mall. This is a huge space for events, large enough to accommodate the special events: Maryland Day, Art Attack and First Look, as well as being the true heart of campus. These events are campus traditions that have survived more than two decades. The university has an interesting history in college sports. Maryland is one of the few schools that has won national titles in football, men’s and women’s basketball. The Terrapins have also won them in men’s and women’s lacrosse, men’s soccer and women’s field hockey. Maryland was also the last university to host a Final Four in men’s basketball. It might be easier to get lost on this campus at first. The academic buildings, the student union, as well as the Cole Student Activities Center, follow the same Southern architectural style. With the exception of the library, all of the buildings in the McKeldin Mall look practically alike. Piller fronted entranceways could be better lit, as could the lobby windows of the building. Building names are also etched into the buildings and not lit. The campus has every possible amenity, but College Park is not much of a college town. Route One, also called University Avenue, is a heavily trafficked retail corridor. While it has many hotels as well as most chain restaurant operations it is best visually described as “urban outskirts.” The speed of traffic usually exceeds 35 miles per hour, quicker than the proper pace of cars through a downtown college town. Ambitious redevelopment plans, however, are underway around campus. The university does not require freshmen and sophomores to live on campus, but most do anyway, especially if they are in an honors or living-learning community. But it costs more to move off. Check out the off-campus housing database and you will see many rentals in College Park that cost over $1,000/person/month. Parking on campus is a hassle practically everywhere. According to a Maryland traditions book produced in 2011 by alumni Margaret Hall and Linda Martin, nearly 16,000 of the 18,500 parking spaces on campus require some form of permit, and most are not accessible to students. The University of Maryland-College Park is a large state university like many others, that shares the advantage of location with only one other (George Mason University), and does a great job to try to make a large school feel smaller through honors and living-learning communities. If someone tells you that Maryland is one of the best state universities in our country, don’t argue.